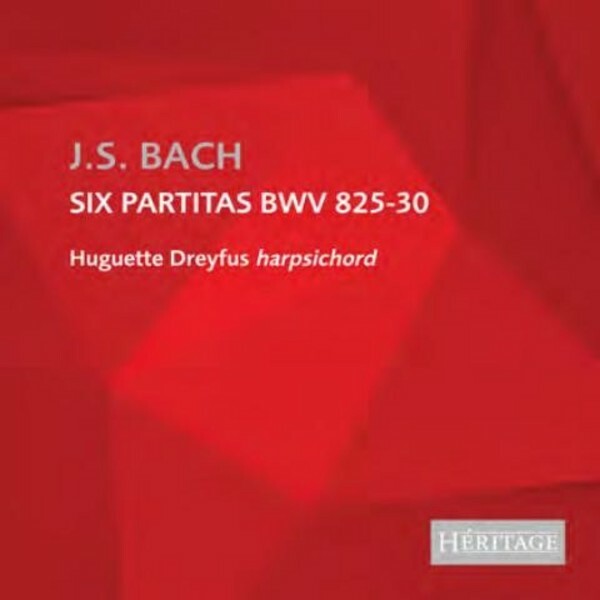 Eminent French harpsichordist Huguette Dreyfus made a set of recordings of Bach’s Keyboard Partitas for the Denon label in the 1980s – they were instantly cited as amongst the best interpretations on harpsichord but have remained unavailable for over 20 years. She is noted for her highly musical playing, allied to an enviable technical facility while remaining entirely faithful to the score in front of her. The sound recording is of demonstration quality. The performances appear on the Heritage label, courtesy of SLG, as a 2 CD set in slim-line packaging. Harpsichord enthusiasts will have no need to be introduced to the playing of Huguette Dreyfus since she has been amongst the most prominent of French virtuosos over the past 35 years or so. She studied at the Paris Conservatoire and with Wanda Landowska, and has since specialised in interpretations of Couperin and Bach. Many labels have recorded her – DG, Denon, Erato, Philips and Harmonia Mundi to name but a few. She has been an incredibly influential teacher and her alumni include Christophe Rousset, Olivier Baumont, Yannick Le Gaillard, Noëlle Spieth and Jory Vinikour.